With almost 2.4 million acres, Spain boasts the biggest vineyard area in the world. Though Spain trails Italy and France as the third biggest wine producer, it ranks first in wine exporting — meaning you can probably find Spanish wines near you. Spain’s diverse geography enable the conditions for producing an impressive variety of wines, including many affordable options. In fact, there are 14 wine regions in the country and over 60 different regional DOs (Denominación de Origen). Selecting a Spanish wine does not have to be a daunting task. 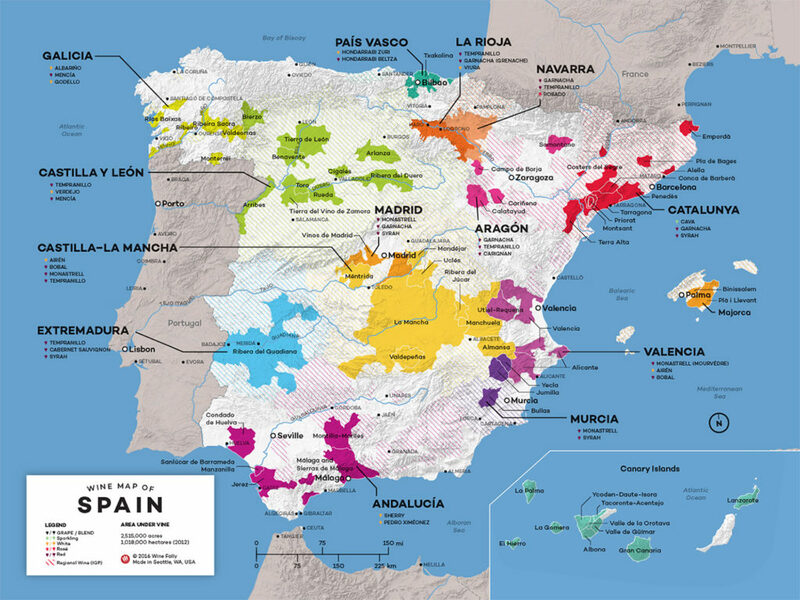 Let’s learn about Spain’s wines and its regions, so you can confidently choose a nice bottle to try. Though wine production in Catalonia dates back to ancient Rome, wines from Priorat are relatively new. This highly acclaimed red wine sub-zone from the Catalan wine region produces mainly single-grape red wines characterized by their dark color, intensity, and potent body. Priorat offers excellent quality wines, and though high in price, they are worth the investment. Rioja is the flagship region for Spanish wines. In fact, Rioja and Priorat (DOQ) are the only wine regions that hold the preeminent DOCa (Denominación de Origen Calificada) status. Rioja produces Tempranillo grapes, usually blended with Mazuelo, Grenache and Graciano grapes to produce delicious wines in a wide range of prices. Because they tend to be full-bodied, Rioja wines pair well with roasted meats and spicy chorizo. The Duero River starts in Portugal where it is known as the Douro. Wine regions lie on both sides of the river. Ribera del Duero, a DO located in the Castilla y Leon region, grows mainly Tempranillo grapes, creating flavorful, full-bodied red wines with plenty of character. Cabernet Sauvignon lovers should definitely try a wine from this region. Toro (Spanish for bull) is a smaller wine region along the Duero Valley. Its main wine grape is Tinta de Toro, a mutation of Tempranillo. Toro wines are similar to the ones produced in Ribera del Duero. Viticulture in the area dates back to pre-Roman times, but as this region is lesser known abroad, you’re sure to impress your friends! Unlike the rest of Spain, the Galician climate is quite different. Lots of rain makes the valleys lush green, the perfect conditions for white wine production. More than 90% of the wines produced in Galicia are white wines. Rias Baixas is the wine region to look for when buying a bottle of Spanish white. Albariño is the champion grape of the sub-region called Rias Baixas, close to the Atlantic coast. Here you’ll find zesty white wines to pair perfectly with seafood. Located along the Mediterranean coast, the DO Penedes offers the Catalan queen of sparkling wines, Cava. Cava, the only sparkling wine produced under the Champagne method, is an instant Spanish celebration. Macabeu, Parellada, and Xare-lo are the main grapes of this wine sub-region. Spain offers so much more than sangria, and the wines mentioned above are just the beginning of what I hope will become a long Spanish wine journey for you. Salud! Andre Arriaza is an avid traveler who loves wine and genuine gastronomy. Based in Barcelona, Andre moves around the world on humanitarian assignments. In his free time, he can be found in local food markets, wine shops or in wineries, talking to winemakers and farmers. You can follow him on Instagram (@cabezurri).